The joy over the birth of a child reminds us that the announcement of Jesus' birth proclaimed God's most amazing gift to mankind. The full-page advertisement in the newspaper caught my eye immediately. Near the top of the light-blue page was the silhouette of a star. In the center of the page were the words…IT’S A BOY! 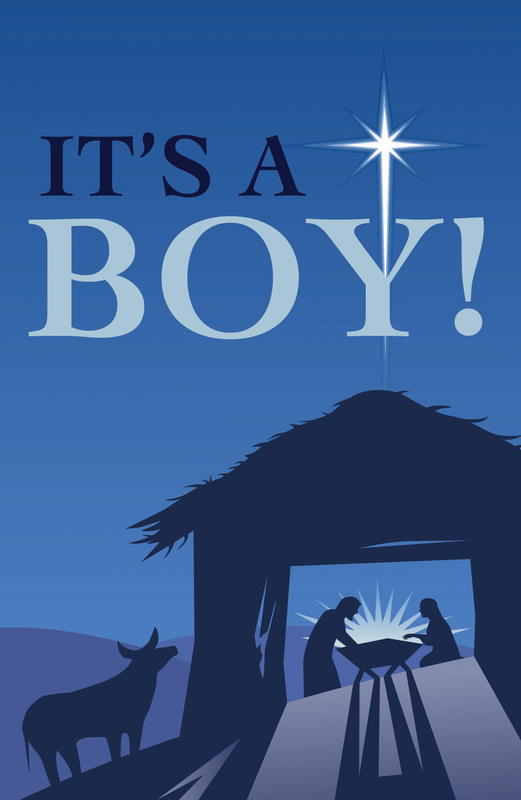 This simple message—“It’s a boy!”—proclaimed the indescribable gift of a Savior who came to earth as a baby. We needed God to send Jesus. Because of our sin we were separated from a holy God: “For all have sinned and fall short of the glory of God” (Romans 3:23). A perfect Savior and mediator were needed to bring us back together. Only God could restore the relationship. Jesus came “to take away sins, and in him there is no sin” (1 John 3:5). “For there is one God, and there is one mediator between God and men, the man Christ Jesus, who gave himself as a ransom for all” (1 Timothy 2:5-6). God wanted to send Jesus. “God so loved the world that he gave his only Son, that whoever believes in him should not perish but have eternal life. For God did not send his Son into the world to condemn the world, but in order that the world might be saved through him” (John 3:16-17). He loved us so much that he gave his only Son so that our relationship could be restored. He gives us the opportunity for a personal relationship now, and forever with him in heaven. Jesus was the only One who could meet God’s demand for perfect justice, requiring a perfect sacrifice. No mere man could ever qualify; only Jesus—the God-man—was sinless. “How much more will the blood of Christ, who through the eternal Spirit offered himself without blemish to God, purify our conscience from dead works to serve the living God” (Hebrews 9:14). Jesus willingly came to earth to be born…in order to die. He said, “I lay down my life that I may take it up again. No one takes it from me, but I lay it down of my own accord” (John 10:17-18). He gave his life on the cross so we could have the opportunity for eternal life! Without the Father’s love and the Son’s sacrificial substitution for us, we would be without hope. “For the wages of sin is death….but God shows his love for us in that while we were still sinners, Christ died for us” (Romans 6:23, 5:8). God accepted Christ’s death in our place and raised him from the dead to prove our debt of sin was fully paid. “Christ Jesus is the one who died—more than that, who was raised—who is at the right hand of God” (Romans 8:34). That’s why the Bible makes these promises to those who put their trust in Jesus alone for salvation: “Everyone who believes in him receives forgiveness of sins through his name” (Acts 10:43), and “Whoever has the Son has life” (1 John 5:12). Because of our great need and his amazing love, God the Father gave us the gift of “a baby boy”—Jesus Christ, his only Son. Accept the gift of God’s Son, receive his transforming life for your years on earth…and for eternity!